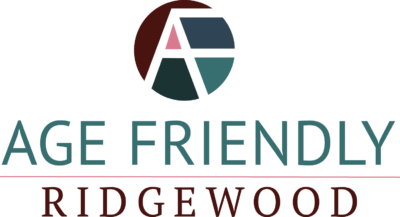 Age Friendly Ridgewood is a non profit collaboration of Ridgewood citizens and organizations working for the past two years on making Ridgewood aware of the needs of those 55 and over and creating projects aimed at addressing those needs. Because of our grant funding from the Henry and Marilyn Taub Foundation plus additional funding from the New Jersey Department of Transportation, we were able to conduct a Senior Walkability Study last June, which we are pleased to make available to download and view here. During the Walkability Study professionals from NJ DOT, WSP and Civic Eye Collaborative facilitated a workshop presenting information on senior mobility; conducted and lead a field walk to observe and experience senior mobility issues along Maple Ave., the CBD area, and the train station; and then finished the day with a brainstorming session to discuss what was observed and to solicit ideas on improving conditions. Deputy Mayor Sedon attended along with representatives from our engineering and police departments, County officials, Charley DeMarco, chair of the Citizen’s Safety Committee, Deanna Schablik, Brigette Bogert, and older Ridgewood residents from the Village, Share Houses, and Ridgecrest. The result is a professional report with many excellent suggestions about how we can make Ridgewood more walkable and safe for all Village residents, not just seniors. During the walkability study we were made aware of the fact that some of our crossing guards would use the summer to audit Ridgewood sidewalks for problems. Now that crossing guards are out sourced, the sidewalk summer audit may not happen routinely, so a group of 8 residents volunteered their time this past November to walk the sidewalks in the Central Business District looking for sidewalks that posed tripping hazards because of cracks or breaks based on the measurement parameters provided to us by Chris Rutishauser. With all of our Age Friendly efforts, we have been grateful for the attention and dedication Chris Rutishauser has shown to issues we have raised. We view both the Walkability Study and the Sidewalk Audit as a way to support his work knowing how much he and his department have on their plates. We also appreciate the enthusiasm shown by the Citizen’s Safety Committee who spent their December meeting discussing and reviewing the study and the audit. They too support our efforts in asking the Village officials to review the materials, budget for improvements, and continue the work the Village has already begun to make Ridgewood a safe and walkable community. One very troubling area is at the intersection of Franklin and Broad Street. There curb cuts are missing, the street crossing is long, and sidewalks along Franklin on the south side are dangerous.